My annual Christmas list of which food and cookery books to buy is in the Ham and High today. As I couldn’t fit in all of my recommendations due to a limited word count, below are the rest of my picks. Vanessa is very entrepreneurial, a skill she no doubt attained from her marketing background. 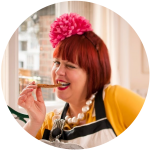 She’s started a cookery school, a sourdough club, does social media campaigns, and contributes regularly to Radio 4’s The Food Programme. She has an exuberant personality for, like me, she has an Italian background. I once asked her ‘Do you feel at home in England?’ because really, if you have an expressive personality, it can be quite difficult. It’s hard to be English, it is very class bound. And if you don’t act like that, you are viewed with suspicion. All of this is a preamble to Vanessa’s book which is cleverly done. 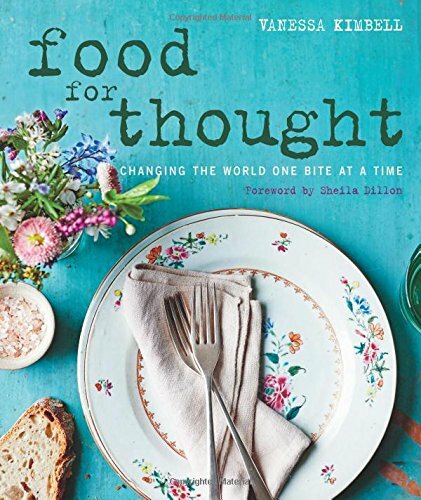 She softens the political food activism with sheer prettiness of presentation with lovely food styling and photography. The recipes have witty titles such as Rubber Glove Nettle Soup. I’d like to cook: Don’t destroy the rain forest digestives and Support Your Local Miller Sourdough Pappardelle. Part of my interest in vegan food is technical, for there are advanced techniques for making some of the staples. This book will tell you how to make many of the things in my book V is for Vegan but goes even further into the geekdom of cooking. It tells you how to make uncrab cakes, unfish sticks, unburgers, unsausages, vegan fish sauce, vegan melty cheese, flax seed meringues. 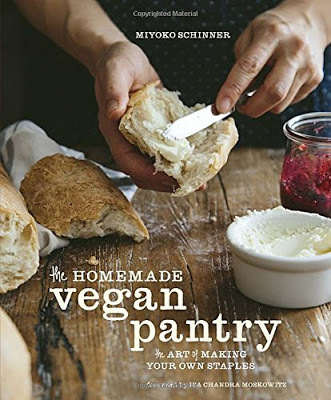 An excellent book for the dedicated vegan cook. This isn’t a beautiful but slightly useless ‘gift’ book but it is extremely useful to anyone on a vegan diet or wholefood diet. Author Jodi Berg is a descendant of the original Vitamix developers, the Barnard family. The story of the Vitamix developed because her grandfather suffered from terrible digestive problems. The family were fans of Dr Kellogg (he of the cornflakes) who was an early adopter of the meat-free diet. ( I talk a little about the history of veganism in my book V is for Vegan). I use my Vitamix most days, it’s such a useful ‘gadget’ for making flour from any grain, for sauces, soups, curds, mayonnaise…you name it. I really liked Russell’s last book ‘Polpo’ and I like this one even more. 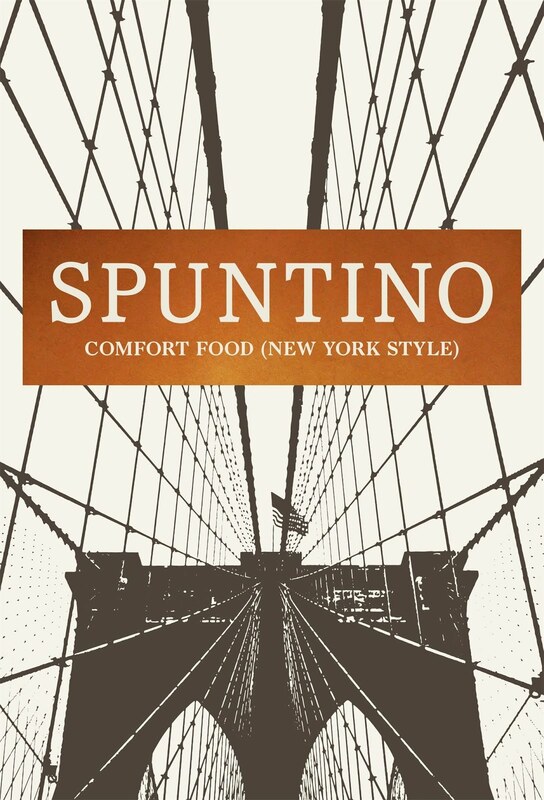 It’s got the kind of recipes I’d actually like to cook, most of them devised by the head chef at Spuntino, Rachel O’Sullivan. The recipes are well pitched, somewhere between restauranty and creative home cooking. Again this book has the innovative design and feel of Polpo with the naked spine and stitching and a smart urban bronze shiny plaque on the cover. (My mum who is an artist says: always have a bit of gold in a painting, it sells). It has a pull-out section (that you don’t actually pull out) on Williamsburg, the area of Brooklyn where it could be fairly said that Norman gets a great deal of his ideas for restaurant concepts. But mainly this book is all about the cookable recipes. Casual reportagey food photography by Jenny Zarins which suits the concept. I’d like to cook: Mackerel Slider and Pineapple and Liquorice, plus Dutch Baby. Recipes from London’s legendary street food truck which started life in my back garden, which they mention in the credits. They’ve gone on to be one of the most successful food businesses, lauded by Caitlin Moran among others. 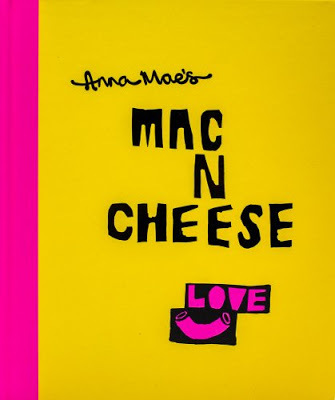 Here is their cute, bright book on some of their recipes, notably for their fantastic mac n cheese of which there are several versions here from a Jewish Deli ‘Macshugganer’ to a blue cheese macaroni cheese, a French one and a classic American standard. A must for carb n cheese lovers. One of the Amazon reviews says “I’ve put on half a stone already”. What better recommendation for a cookbook? 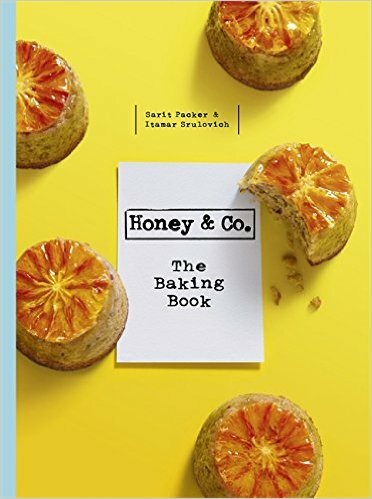 Apart from anything else this book is a bargain in terms of content, it has almost 150 recipes. 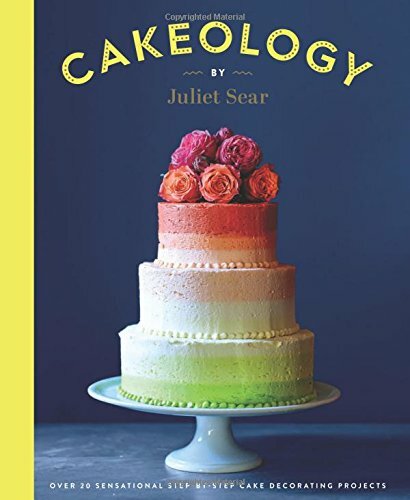 The book is divided up in chapters by time of day; dead of night, first light, elevenses, lunch, tea time and after dark, which seems appropriate in that traditionally baking in done in the middle of the night. The recipes are international, with an emphasis on Middle Eastern and Israeli baking. Definitely a book you’d actually use. I’d like to cook: Pocky Sticks, the Clementine cake and Su Boregi. Forget your bake-off amateurs, this is a woman who really knows her stuff, Juliet Sears is a professional baker who supplies the birthday cakes to the stars. Some of her cakes and ideas look rather difficult to achieve but there are detailed step by step instructions and graphics. Sears tells you when it’s a hard project or an easy job and delightfully bossy (after my own heart) when telling the reader what to do. Every command here is born of hands-on experience and she’s not holding back any secrets. This is a very different sort of baking to Honey and Co but if occasionally you yearn to have a go at a less casual, more theatrical cake, this is the book. I love that nursery expression, the cuddly word ‘pudding’ (derived originally from the French boudin), that we English use. Americans are terribly po-faced and think pudding only refers to a certain kind of dessert. 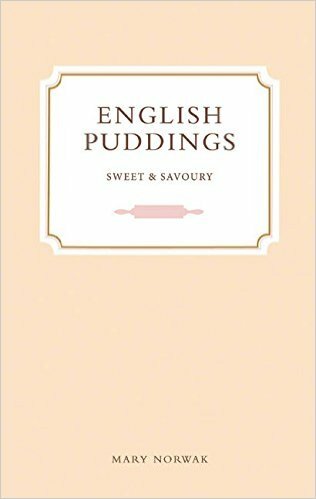 All dessert ultimately is ‘pud,’ as in ‘what’s for pud mate?’ This book has chapters on blancmanges and flummeries, junkets and syllabubs, custards, fools, dumplings, fritters… aren’t these simply some of the best words in the English language? So nostalgically evocative and roly-poly, Georgie-Porgy, pudding and pie, FUN. Mind, I was one of the few children at school who loved tapioca with jam. Each recipe has a little of the history, for example: before such modern fripperies as the fork, meringues were beaten with birch twigs. Or how her father liked milk puddings Tudor style, with butter and spice. Or the difference between the English ‘Floating Islands’ (mentioned I think in Patrick O’Brian’s books) and the French ‘Iles flottantes’, the latter a much lighter affair. Or the interesting nugget that pies had different shapes and pastry decorations so that bakers could recognise their pies in the communal ovens. This book has no pictures, just text and is small enough to take on the bus. I’d like to cook: I’ve made a few of the recipes in the past…’boiled baby’ and ‘peas pudding’ and genuine almond blancmange. I’d like to make Damask cream, Geranium cream, Prince Consort pudding. Fermentation and canning have been a la mode for the last semi-decade, although pioneers such as Sandor Ellix Katz have been resuscitating these ancient preserving techniques for years. 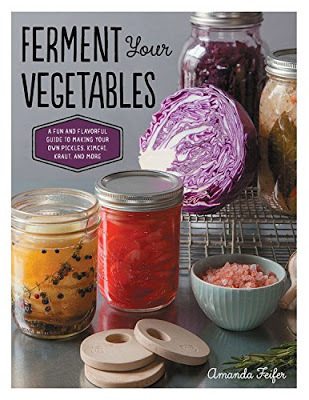 American author Feifer is knowledgeable, with chapters on kimchi, kvass, kraut, fermenting in crocks (I’ve bought myself a sauerkraut crock), how to make a cabbage ‘shelf’ and techniques I’d never heard of such as misodoku and nukadoku, which are Asian pickling styles.This is a book I can learn from. I’d like to ferment: Miso Rhubarb, Healing Burdock Turmeric Pickles. Parisian concierge Adrian Moore and photographer Carrie Solomon spent months visiting Michelin starred chefs and having a peek inside their fridges. The results are both intriguing and a relief: yes there are exotic ingredients but also the homely simple food that these chefs and their families actually eat. Alongside the fermented elderberry flowers, the squid ink and the fresh whole lobsters, there will be a jar of Nutella. 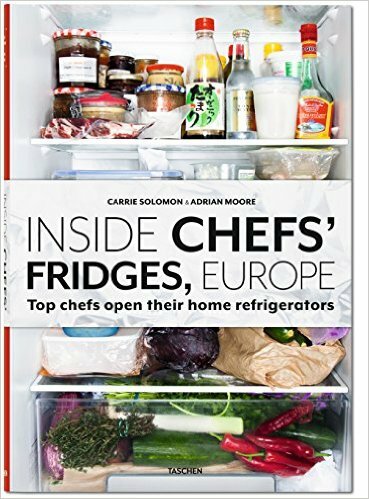 The contents and even the type of fridge do seem to be representative of each chef’s style: Ottolenghi has a fridge stacked full of tiny jars with exotic ingredients, rather like his recipes, while Marco Pierre White has refurbished a grand and vintage wooden fridge. 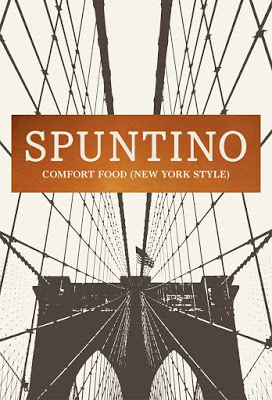 This is a fantastic gift book for those who like art, chefs, travel and food. Trish has spent the last twenty years living in Paris, becoming a celebrated cookbook author which is no easy task in chauvinistic France. 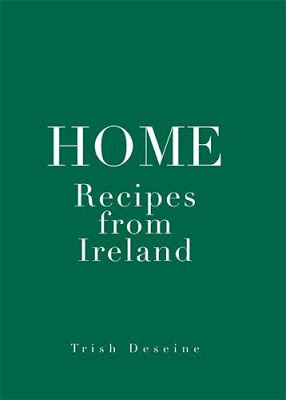 But now she’s returned home to Northern Ireland and created this book containing recipes using the restricted palette of Irish ingredients only… so no olive oil, no pomegranates, no Mediterranean herbs, only foods that can be grown in Ireland. 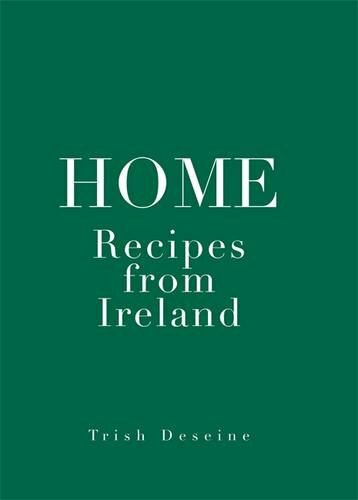 The recipes are both nostalgic and modern, a new look at Irish cooking. It also has atmospheric photographs, gorgeously bleak in the Irish misty light, by Deirdre Rooney. Some of my best meals are created from leftovers so I’m immediately on board with a book on what the French call ‘les restes’. 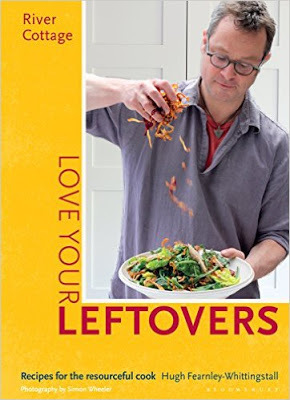 With the assistance of brilliant cookery writer Debora Robertson, Whittingstall has written a resourceful tribute to the art of efficient housekeeping and the carefully managed pantry. There is even a recipe for fried fish skeletons! I’d like to cook: Arancini patties, Paneer. I love the atmosphere in this book which is beautifully styled and photographed. I think winter is the best season for cooking, after all it’s when you are at your hungriest and you don’t have to worry about calories as you will shiver them off. (Freezing your fat off is a new thing). 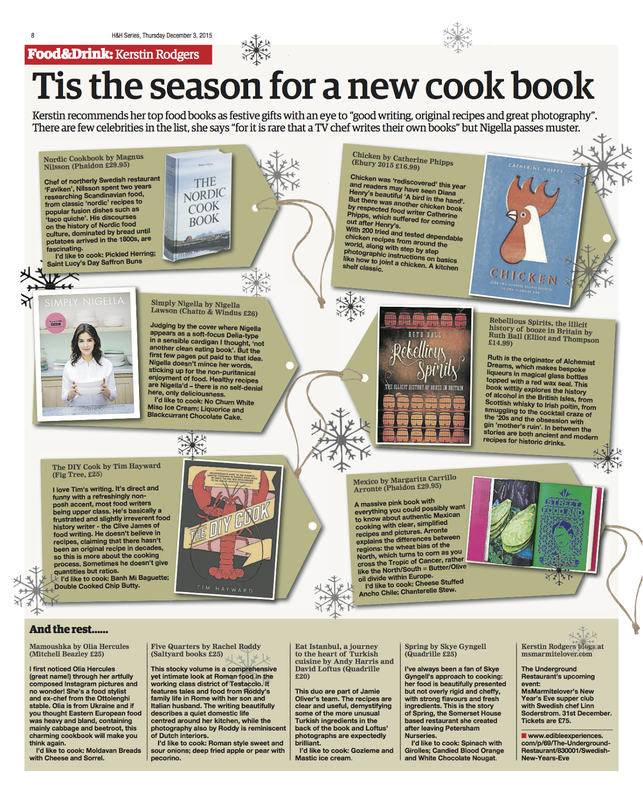 You’ve got all the chalet girl favourites, gorgeous rib-sticking food that acts as a culinary woolly jumper. 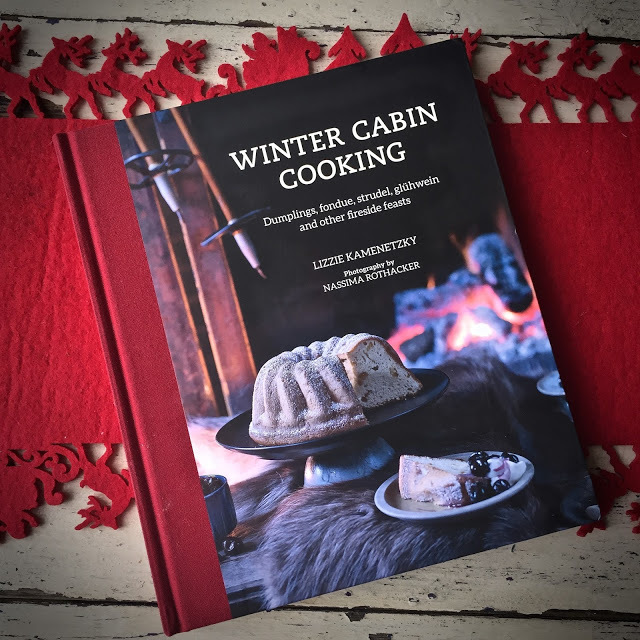 Lizzie also features dishes from American mountain ski resorts such as Huckleberry pie as well as Alpine recipes like rosti. My only issue with it as a non-meat eater is that it is so meat focussed. You don’t need meat to feel warm and cosy…potatoes and cheese do the job so much better. I’d like to cook: the proper Apfelstrudel, Heaven and Earth pie. This pretty notebook style cookbook with some of Rachel’s charming illustrations and watercolours is perfect for a young cook wanting to explore slightly harder, more exotic recipes, that have been thoroughly tested. Cute! I’d like to cook: Japanese Teriyaki salmon steamed buns! My whole family are toast fiends. It’s the easiest ‘recipe’ for a country that has one of the highest electric toaster ownerships per capita in the world. I asked Which magazine what percentage and they said 90 % sounded about right. 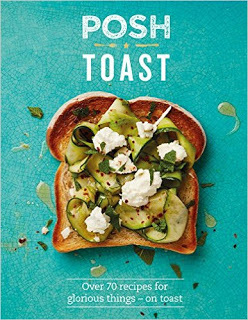 This book is full of toast topping suggestions. (I also have vegan toast toppers in my book V is for Vegan). A very pretty book. I’d like to toast: Parmesan pain perdu and piperade. Alan Rosenthal specialises in one pot dishes such as stews, he’s managing director and creator of Stewed.com which is sold in supermarkets. After grilling, the one pot dish is the basis for the earliest cooking, probably as soon as mankind invented some kind of pot that could be heated, perhaps inspired by using the animal’s stomach as a pouch for all the ingredients. 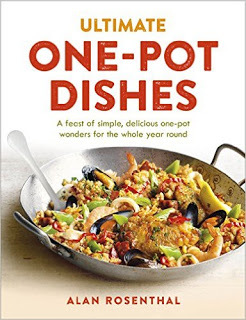 Unfortunately for me the recipes are very meaty so there wasn’t much I would want to cook from it, but a good selection of stew-like dishes from around the world. I’ve cooked: the Succotash recipe which worked well. 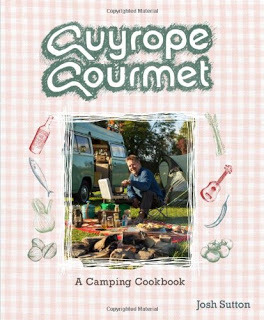 Josh Sutton is also known as Guyrope Gourmet and has been featured on TV and in the press for his ingenious camping recipes. I love camping and cooking outdoors when the weather is fine. Food tastes better when eaten outside, I’m convinced. Have you ever had a portion of chips in the street, even eaten in the rain on a freezing Northern night? How good does it taste? So much better than if you have it at your centrally heated home on a plate. Josh has some engaging tips for camp cookery, such as barbecuing on an washing machine drum, what kit to take with you on a trip and what key ingredients you’ll need. My kind of cook! A good pressie for men, women, boys and girls. This is a graphic novel by a friend of mine from my activist days. I met Kate when I was squatting at the London Fields Lido, along with another friend who has also done well, the street artist Stik, who also brought out an art book this year. It’s amazing how much talent was in that place. 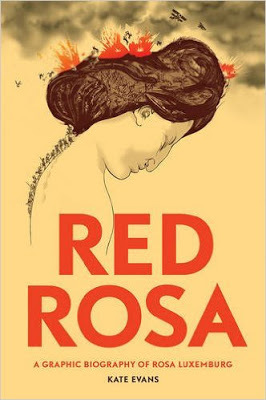 Beautifully drawn, this is the biography of Rosa Luxemburg, writer and political leader, one of the 20th centuries best known revolutionaries. I think some of the best work being done nowadays is by graphic novelists, for instance I’m a big fan of The Walking Dead TV series. Highly recommended. My gardening/cooking book Christmas gift list can be seen here at this link. Fascinating as always. What more can I say. I can see quite a few people ordered books from this list due to my amazon associates link.